Like "rojos", flexible waveguide sometimes can get you out of a tight design situation. Check out our new flexguide content! 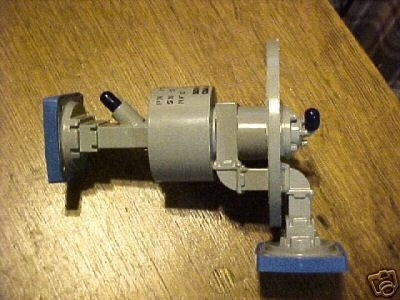 Rotary joints are what is used to connect a radar's transmitter and/or receiver to its antenna, in the case of an antenna that must rotate (like an airport surveillance radar). There are many other examples of rotary joints that are non-microwave, in the electronics industry as well as hydraulics. Microwave rotary joints come in two flavors: coaxial (often used on missile seekers as the more compact solution), and waveguide. In the case of waveguide, the joint itself is done in circular waveguide, otherwise it wouldn't work. The flanges are usually rectangular. Waveguide rotary joints will handle more much power than coax, and have less loss. Here's two views of a rotary joint fresh from the paint shop. The silver plating on this is a little dirty from the masking process and the heat of the paint over, but this would be cleaned up before being shipped out. This is a WG12/WR187 part, operating from 4-5.85 GHz. Thanks to Tom Pearce from The Waveguide Solution in the UK! There are at least two examples of failed rotary joints in our microwave mortuary. Here is one image. This type of failure provides the best argument for AESAs! Yes, that rectangular waveguide is made of aluminum, and now it looks like taffy. There's some pretty amazing torque responsible for that! "Rotary joint" is sometimes referred to as "rojo", this is an example of portmanteau in engineering. Rotary joints are usually waveguide for high-power applications (but air coax is also possible). Here's an image of an waveguide rojo we found recently on Ebay. The seller mentioned that the "waveguide part" measures 0.5" x 1.2" inches which isn't a standard size so he must have measured it inaccurately. It must be intended for either C-band or X-band. Note the pressure ports, pressure must be maintained at high altitude for high power handling. There's only a small list of manufacturers of rotary joints in the world, maybe one of them might want to sponsor this page and tell us all about the topic!